The Chown Pella water towers are an integral part of the 13th Avenue Historic District on the National Register and can be seen from across the district. They are two of the three remaining wooden water towers within the Pearl District, and are frequently photographed, sketched, and considered iconic elements of our community. The water tower image is on every street sign of the Pearl, as well as the Pearl District Neighborhood Association logo and the Pearl District Business Association logo. To lose these towers, would be to lose a piece of our history. These water towers were installed as part of the original Chown Pella building in 1910. They have weathered well over the decades, but now are in dire need of our care to stabilize and restore the structures so that they can be appreciated as part of the Pearl story for decades to come. 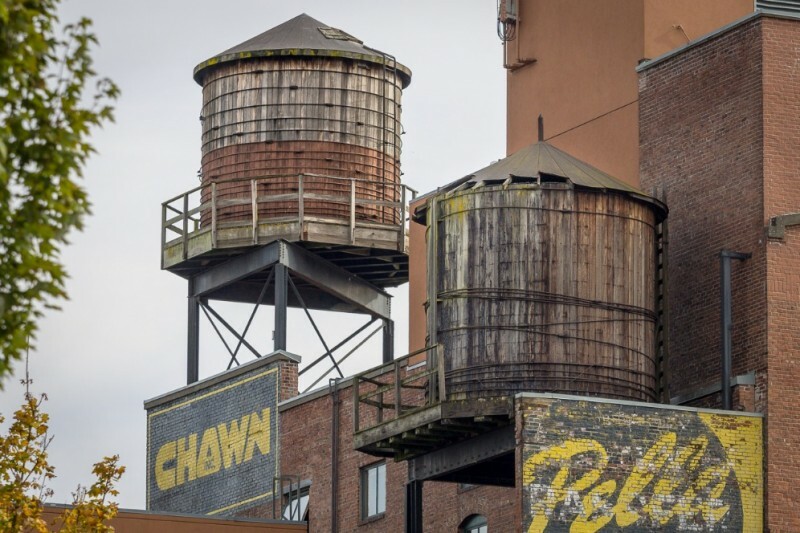 The Chown Pella Board is seeking to partner with the Pearl District community to preserve these historic water towers. Our goal is to restore both towers to avoid their removal. The cost estimate for the restoration project for both towers is $35,000. The Chown Pella community has committed to funding the first half of the restoration costs. We need our Pearl District community’s help to complete this restoration. We are asking you to join us to save these historic towers! Thanks to you, through the Gofundme site and direct contributions we have raised $14,320 to preserve the historic water towers. With the Chown Pella’s commitment of $20,000 we are moving forward with restoration of these water towers! The city has completed the Historic Review process and given the go ahead so now we are obtaining the building permit. Big News: We have the opportunity to light the east tower so the whole community can enjoy the view at night! With the city’s Historic Review we have approval for uplights on the east tower. The final phase of the campaign to raise $5500 will pay for the installation of the uplights. Your gift will help reach that goal! Donors of $100 or more will receive note cards with the photographs of towers by Tom Hassler, noted professional photographer, who lives in the Pearl District. Receive a signed, limited edition print and set of notecards of the towers by Tom Hassler, noted professional photographer, who lives in the Pearl District.